Radio Programming Equipment - Model-2-RBLS - Only $49.95! Please note: This cable does not require the use of a Programming Adapter (PA-1, PA-2, or PA-4) in order to function. 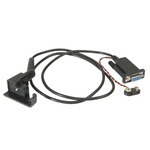 This cable CAN be connected directly to your computers SERIAL Port without use of a Programming Adapter.